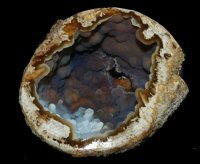 Fantastic Agatized Coral Geode [COR445] : Fossils Online, Welcome! This is one of my favorites. Lots going on in this translucent gem. 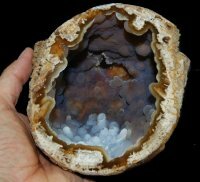 Different shades of color -- bluish gray to white bubbling, boitryoidal chalcedony. The translucence of the chalcedony gives it a multi dimensional appearance. 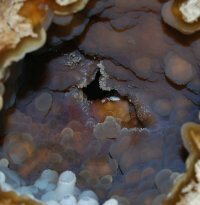 At the back of the geode some crystals formed on the chalcedony as some new minerals were introduced through the hole. The sand in the river gently polished the outside area of this hole that was exposed. The face has been polished to a glass like finish. The pictures can better describe this exquisite piece.